Heat oven to 400°F. 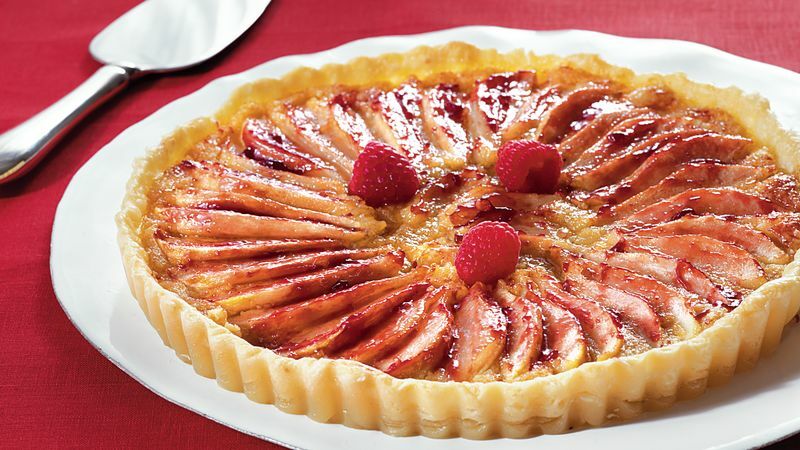 Place pie crust in 9-inch tart pan with removable bottom as directed on box for One-Crust Filled Pie; trim excess. Bake 5 minutes. Cool completely on cooling rack. In medium bowl, beat sugar and 1/4 cup butter with electric mixer on medium speed until creamy. Beat in egg until blended. Stir in crushed cookies, almonds and almond extract; spread evenly over crust. In large skillet, melt 2 tablespoons butter over medium-high heat. Add pears; cook 5 minutes, stirring often. Remove from heat; arrange pear slices over almond mixture. Bake 20 to 25 minutes or until lightly browned. Cool on cooling rack at least 15 minutes. Heat jam over medium heat. Brush over pears. Garnish with raspberries.